With more than 340 million active users and a 27% growth rate between Q2 and Q4 in 2012, Google+ has now became the second largest social network in the world. Here are some useful tips for users new to Google+. To make the text bold, enclose word(s) in *. The screenshot below show various text formatting options inside G+ posts/comments and the next one shows the resulting displayed text. Select ‘Account’ -> ‘Google+’ . Scroll down the page to ‘Communities’ section and check/uncheck the option ‘Show your Google+ communities posts on the Posts tab of your Google+ profile’. Go to the Profile of person whom you want to send a private message. Click on the small envelope icon in the top right. Write your message in the Share Box and click ‘share’. 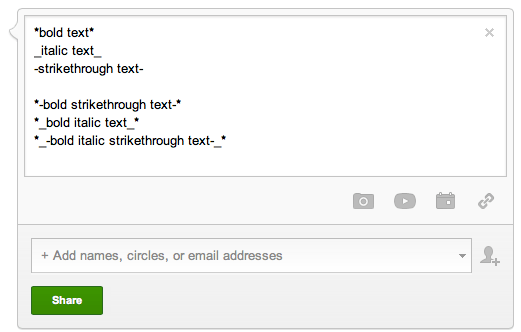 Alternatively, click ‘Home’/‘Profile’ on the left in Google+ and simply type the name of the person in the Share Box. Make sure to remove any previously added circle name/‘Public’. You can also prevent re-sharing of this post by clicking the down arrow in the recipient’s name box and selecting ‘Lock this Post’. Organizing people you follow in appropriate circles will help you in getting the most out of Google+. In Google+, select ‘Find People’ from the main left sidebar and go to ‘Your Circles’ tab. Google recently changed their very visible and intuitive menu ‘Circles’ to ‘Find People’. This left many users wondering about their missing circles! One of the best features of Google+ is the option of de-cluttering your home stream by controlling the amount of posts that appear in your home stream from a particular circle. Select the ‘Home’ menu in the left sidebar. Select the circle name (for e.g.) ‘friends’ from the top. A gray slider will appear on the right that can be adjusted to receive the amount of received posts from that circle - from none to getting notifications for all posts. What is your favourite tip? Please share in the comments below. Noteshelf App for iPad: The Experience that Mesmerised Me!